Love your 3DS? Love to StreetPass? This is your week! Unless you’ve been living under a rock since this past Thursday, chances are you’ve heard people gushing over the latest and greatest bit of entertainment in all the galaxy. You know, its initials are S.W.? No, not that. Streetpass Week! In honor of the two just released 3DS Streetpass games and an update to the Mii Plaza itself, Nintendo is giving us an unprecedented ten days of access to fellow 3DS owners around the world via AT&T wi-fi hotspots. The first of the new games – Ultimate Angler – challenges your Mii to catch a plethora of fish and other aquatic wildlife. Depending on the shirt color of the Miis you Streetpass, various types of bait are obtained. One type of bait – or a mixture of several – are then strategically used to catch a certain type of fish. Having several Miis at once helps to reel in the big fish. Once finished, the game prompts you to either set the fish free or preserve them in a tank that can be viewed at any time. You can also view tanks of Miis with whom you’ve Streetpassed. After clearing areas, new reels are obtained and can be upgraded or combined with others. For me, the game was fun in short bursts. It’s all about the set up with a dash of action when reeling in the fish and trying not to break the line. The better of the two games, in my opinion, is Battleground Z. Fight your way through hordes of the undead while saving and occasionally teaming up with your fellow Miis. Weapons in the game are obtained from Miis and vary depending on what a Mii’s favorite hobby is set to. For example, is your hobby is playing video games? Your weapon will be a Wii remote. Each weapon has a standard attack and a charged attack. The charged attack can only be used a limited amount of times and if you take too much damage, you lose your weapon. Killing zombies is one of my favorite pastimes, so purchasing the game was a no brainer (pun intended). The price on each of these games is $4.99 or $7.99 for both. If you have the previous Streetpass games that were released in 2013, you can get another dollar off for a total of $6.99. So, what’s the payoff for playing through these games? It’s all about those sweet sweet Plaza tickets. Complete certain objectives in game to obtain them, and once you do, redeem them for hats, outfits, and different themed speech bubbles for your Plaza greeting. I’m digging the new Mii accessories and have so far been sporting a fashionable Wii U hat and an adorable Yarn Yoshi hat. I’ve also been spreading the word worldwide about justusgeeks.com in my Plaza greeting in cool Kirby and Mario speech bubbles. The final additions to the plaza are the VIP room and Streetpass Birthdays. Up to 100 of your favorite Miis can be entered into your VIP room so they don’t get lost in the mix of everyone you’ve ever Streetpassed. Miis will now tell you their birthday when entering the Plaza, so you can try to fill up your calendar with every day of the year to gather more Plaza tickets. The cost for these two added features is $4.99 – which seems a tad steep, as this seems to be something one would assume would be included for free in the update. Has anyone out there picked up any of the new games yet? Got any fancy new accessories you want to brag about? Let us know in the comments below, or on Facebook and Twitter. Meanwhile, Streetpass till you can’t Streetpass no’ mo’….or until April 26th. Whichever comes first. April 16th-26th be with you, always. Bye. Have you listened to the latest episode of the JustUs Geeks Podcast? It’s all about Mortal Kombat! Listen to the episode here! Watch the Jurassic World trailer here! I am 31 years young and have been known to enjoy the occasional video game, movie, TV show, or wrestling event. Catch me on PSN: reel_amERICan or even on MiiVerse: EricPlunk. Please click the link & give my latest article @JustUsGeeks a read. 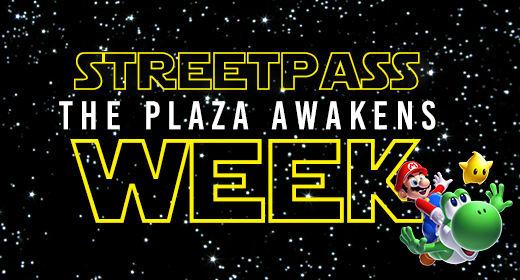 http://t.co/AzsC7OiJkn #StreetpassWeek #StarWars #3DS PLEASE RT! JABEcon liked this on Facebook. Beast Wars now available on Netflix!